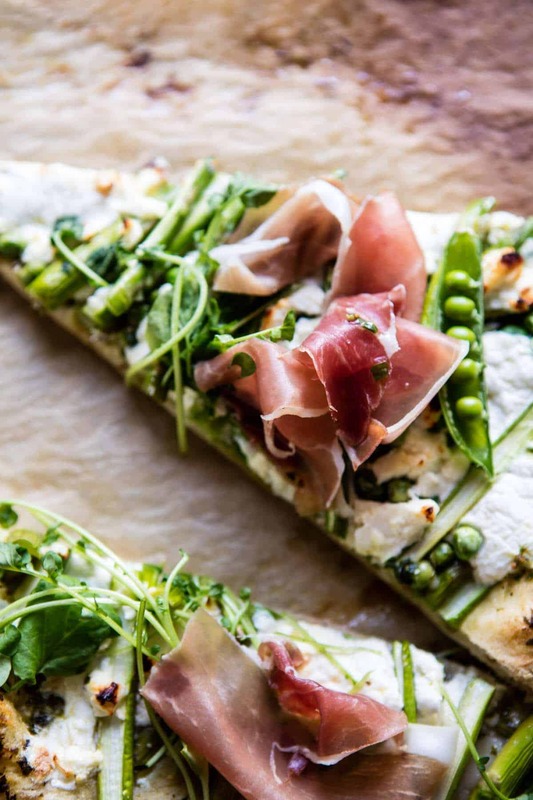 Spring inspired super green pea and asparagus burrata pizza, YESSS! We need pizza this week, trust me, we do! But um, here’s the deal. 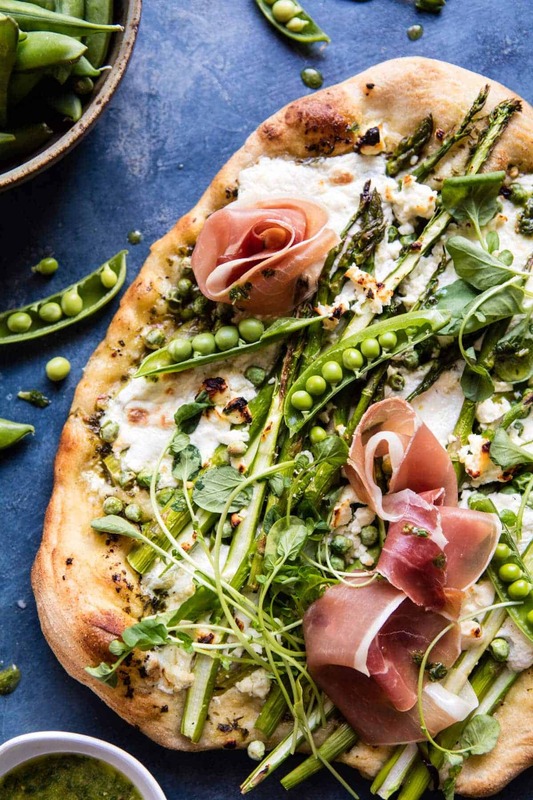 With this pizza, we are not just celebrating spring, but also the fact you guys literally brought me to tears (the good kind) with your comments on Monday’s post. I don’t want to spend this whole post talking about the cookbook, but I just have to say that everyone’s incredibly kind comments were the best thing to ever happen. Just wow – and thank you! I am still in shock over your excitement for the cookbook…and I am still reading through all the comments. As I write this post, there are already over eight hundred comments….soo ahhh yeah, it’s going to take me a second or two to read through each and every one, but I will!! I am just so grateful you guys, and cannot wait for you to see the book in full!! Very excited about it! Anyway, thank you again! Expect more book updates very soon! 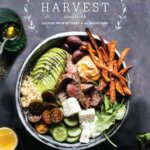 FUN NOTE: The cookbook is available for preorder from these online retailers: Amazon, Barnes & Noble, and Indiebound. If you preorder, the book will arrive on your doorstep September 12th! I will have more pre-order info in another post coming at a later date, BUT for you awesome readers out there who are super eager, you can preorder now…pssst, there will be a major bonus for people who do pre-order, and trust me it’s fun (talking bonus recipes n’ things)! And with that, on to pizza!! I have been planning on sharing this pizza for a while, but today just seemed like the perfect time. 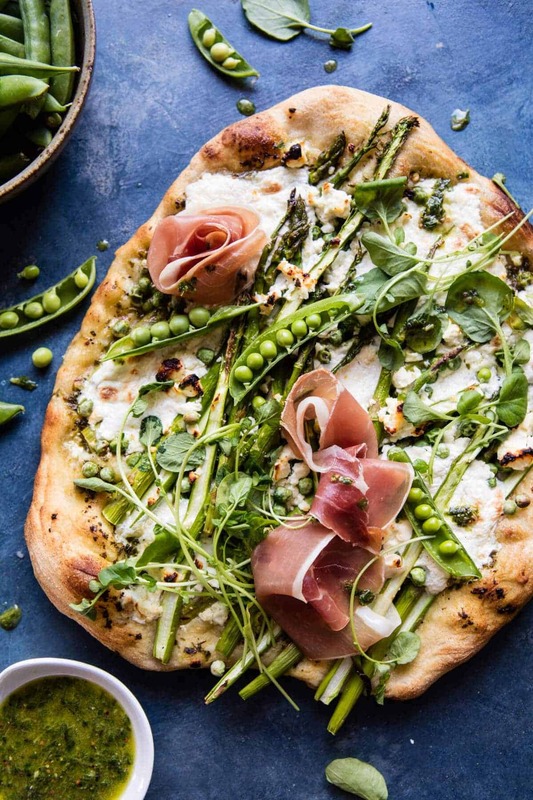 To me, pizza is celebration food, and with spring here, plus the cookbook cover reveal, and the weekend just ahead of us, this pizza seemed to fit just perfectly for today. You guys know I love a good pizza. I’ve made many here on the blog…and yes, there are plenty in the upcoming cookbook, but currently, I am all about this spring pizza. Hello BURRATA…aka my favorite cheese! Plus lots of asparagus, which is one of my favorite veggies…that I somehow just never seem to get enough of. Here’s how this pizza comes together. First up is the lemon pepper basil vinaigrette. This is key, it’s fresh and light, and adds the bulk of the flavor in this pizza. Think super lemony with a hit of pepper and a touch of sweetness and tons of basil. It’s the perfect base, but the leftovers are also great on roasted veggies, meats and salads. Spread the vinaigrette all over your pizza dough and then top with thin asparagus spears and fresh peas. For the peas, I used a mix of sugar snap peas and frozen peas. 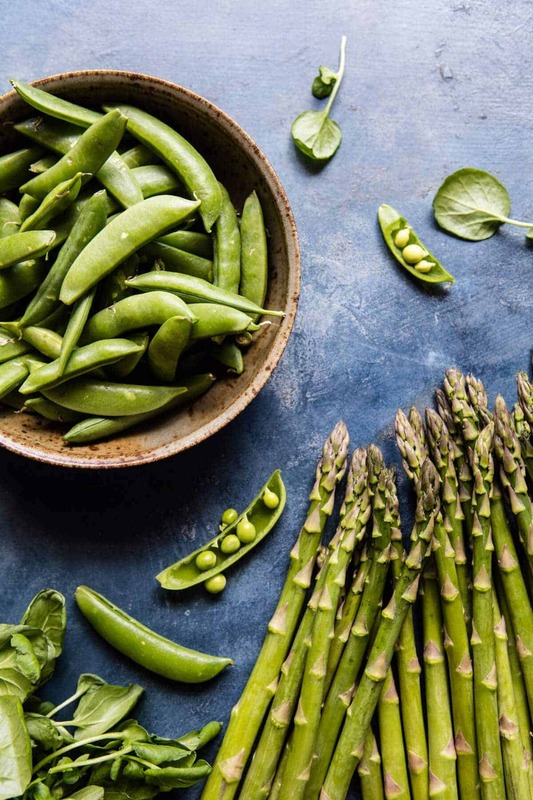 I LOVED the roasted sugar snap peas and highly recommend using them over frozen. They just hold up much better to the heat and taste amazing with a little char…plus the burrata and asparagus that goes on next pairs perfectly with them. They are the best combo. I also added fresh prosciutto, watercress and some chives. Oh, and I almost forgot about the feta! Oh yes, there is feta too, and yes, it’s amazing. The saltiness in the feta balances out the savory flavors of the green veggies and with all that lemon going on too? Yup, it’s pretty much just perfection. 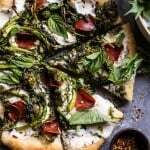 I’m thinking that because this pizza is so loaded with green things and bright colors that it totally counts as healthy, don’t you guys agree? I mean, I know there is cheese and carbs, but if you make this whole wheat pizza crust and go heavy on the veggies, I am really feeling like this is a healthy focused pizza. In all seriousness, I know you’ll love this pizza. It’s cheesy and veggie loaded, which you guys know are two of my favorites. AND it’s the perfect way to celebrate and all around awesome week. The best part? It’s only Wednesday and I only see the week continuing on into greatness as Friday quickly approaches. Got to love when my weeks are this awesome and it’s all thanks to you guys! SO…can we all agree to have fun tonight and relax with some pizza? PLEAASE?? Combine all ingredients in a blender and pulse until combined. Taste and adjust salt and pepper if needed. On a lightly floured surface, push/roll the dough out until it is pretty thin (about a 10-12 inch circle). Transfer the dough to the prepared baking sheet. 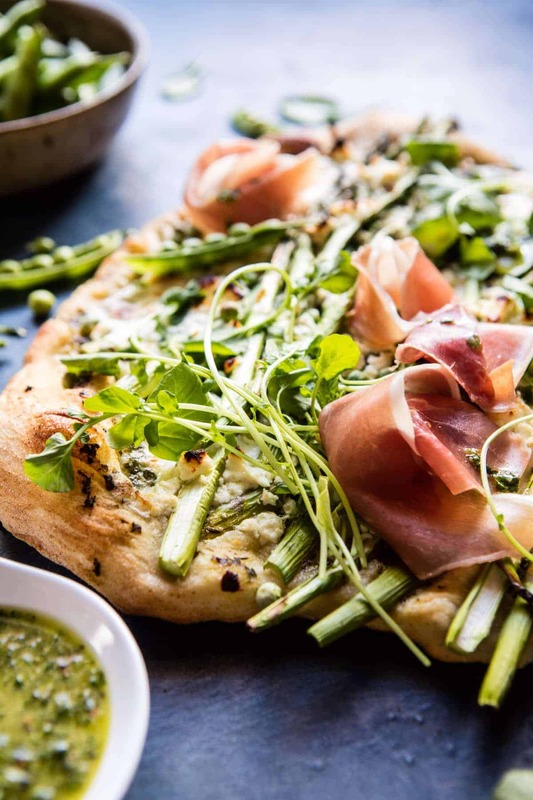 Spread the dough with a couple spoonfuls of vinaigrette and top with the feta, asparagus and peas. Drizzle lightly with olive oil, salt and pepper. Transfer the pizza to the oven and bake for 8-10 minutes or until the crust is golden and the veggies lightly charred. Remove from the oven and top with burrata and prosciutto. Let the pizza sit 5 minutes and allow the burrata to melt. Top with watercress, chives and crushed red pepper. 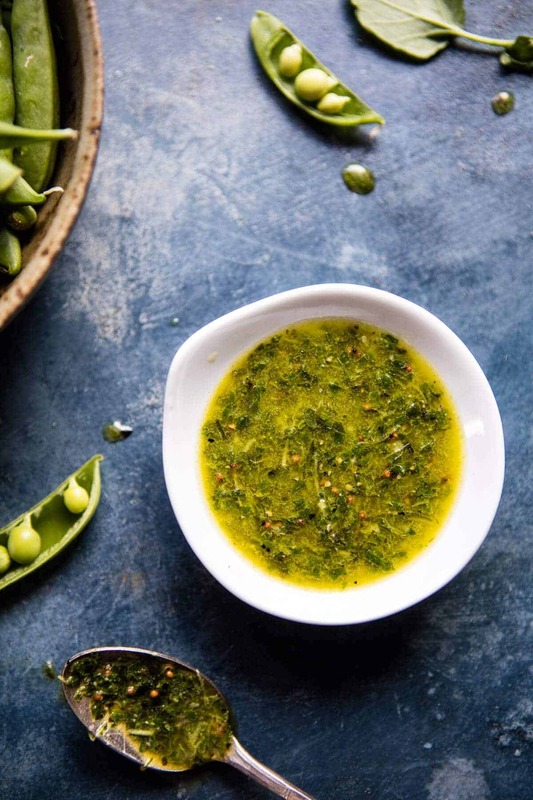 Serve with the remaining vinaigrette. EAT! Cool, glad we can all agree on that! Happy Pizza Wednesday! 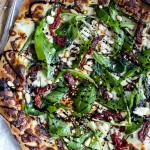 Wow, today is definitely a pizza day, and what an amazing pizza, I am making this right away! Awh, thank you! Hope you love it! This is so my kind of pizza!!! I love asparagus, I love burrata, I love green peas! This is definitely your kind of pizza! Hope you loved it! Thanks Ruthy! That looks fantastic! 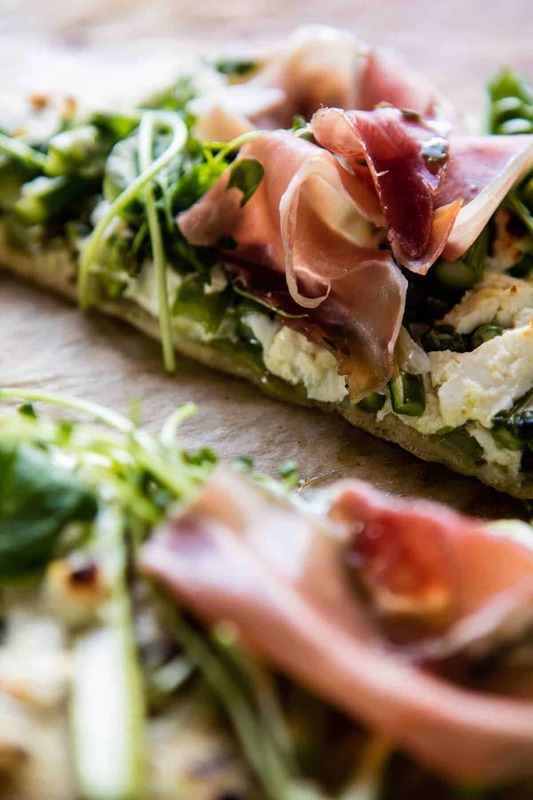 I love a white pizza and that lemon vinaigrette as the base sounds incredible! Thanks!! for sharing this amazing recipe. I will definitely try it at home to impress my husband. Please keep share more recipes like this. I hope hes impressed (: Thanks Layla! beautiful pizza with all my favorite things!! going to make tonight and make the prosciutto look like roses, like the one on top. thanks! Yay, hope you loved it! Thanks Tammy! GORGEOUS!! Cannot wait to try this pizza! Love lemon anything and these are my favorite veggies too! Yay, hope you love it Leah! Thank you! Hey girl! Yesterday I went to a feedfeed event in LA and I was surrounded by talented bloggers and we seriously chatted for like ten minutes at dinner about how superhuman you are and that we will never possess your work ethic. Keep up your amazingness, you’re a huge inspiration. I made this last night for family pizza night and it was fantastic! The lemon vinaigrette was so deliciously bright with all the vegetables, so spring. Thank you for all the inspiring recipes, everything I’ve tried has been amazing! So so happy you guys liked it! 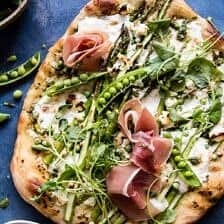 Cette pizza est vraiment belle et elle a l’air délicieuse, je vais essayer de la réaliser pour mon fils qui adore les asperges et les petits pois. We love! We add prosciutto to crisp while baking, then add burrata and herbs. Wonderful! So happy you like it, sounds delicious! Thanks Cathy! We love this recipe! It has become one of our favorites and we make it all spring/summer long. The viniagrette is perfectly zesty. We use the referigerated pizza dough from Trader Joes – so easy. The only change we make to the recipe is to add the prociutto before baking – that way it gets crispy which we prefer to raw on this pizza. Also we chop the asparagus into smaller pieces to make it easier to cut and eat. HIGHLY RECOMMEND THIS RECIPE!! Thanks Tieghan!! Thank you Cathy! I am so glad you enjoyed this recipe! I’d like to eat pizza in my daily routine. I am very touche with these foods. I love to bake this in my home also. 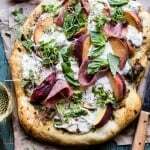 I am totally hungry too see this burrata pizza. I have eaten lots of pizza’s my life but this one is totally special for me.